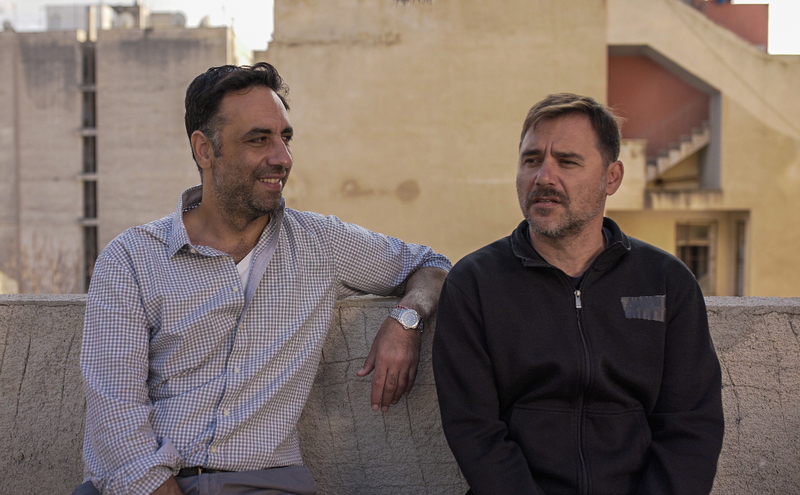 This year’s EURIMAGES CO-PRODUCTION AWARD, an award acknowledging the decisive role of co-productions in fostering international exchange, goes to two fellow producers: Konstantinos Kontovrakis and Giorgos Karnavas. The EURIMAGES CO-PRODUCTION AWARD will be presented during the European Film Awards Ceremony on Saturday, 15 December, in Seville (Spain). Konstantinos Kontovrakis was born and raised in Athens, Greece. He obtained a BA in Film Studies and English Literature and an MA in Arts Management in London. He has published film reviews and articles in various Greek media and edited publications while collaborating with the Thessaloniki International Film Festival, for which he worked for ten years mainly as a programmer. In 2010, Konstantinos turned to production as an executive for the film WASTED YOUTH by Argyris Papadimitropoulos & Jan Vogel. The film was the official opening film of Rotterdam’s Tiger Award Competition and became an international arthouse and festival hit. This is where he met with Giorgos Karnavas, who produced the film and together they worked on various features as independent producers. Konstantinos was “Producer on the Move” for Greece in 2014 and he is the national representative of EAVE in Greece. Giorgos Karnavas was born in 1973 in Athens, studied Political Sciences at the University of Athens and Finance at the Hellenic Management Association while taking courses on scriptwriting. In 1998 he joined Stefi Productions and was the General Manager and Head of Events from 2007 to September 2012. He is the founder and producer of Synch Festival (2006 Best European Electronic Music Festival). During his career as event producer, he has promoted shows by artists such as Pet Shop Boys, Antony and the Johnsons, Nine Inch Nails, Einstuerzende Neubauten and Róisin Murphy. Giorgos Karnavas entered film production in 2010 and is a member of ACE and the European and Greek Film Academies. He was a “Producer on the Move” in 2013 when he joined forces with Konstantinos Kontovrakis in order to establish the Athens-based production company Heretic (http://www.heretic.gr). Heretic is focusing on quality-driven films and international co-productions, dedicated to working with filmmakers with a natural talent for storytelling and bringing like-minded people together. Holding strong ties with the international film world, Heretic looks for projects with an international perspective and ensures their position in the world-wide market from development till completion. The company produced the Eurimages-supported films SON OF SOFIA (EFA Feature Film Selection 2017) by Elina Psykou, which won the top prize of the International Narrative Feature Competition at the last edition of the Tribeca Film Festival, and PARI by Siamak Etemadi, which was selected for the prestigious L’atelier of the Cinefondation of the Cannes Film Festival in 2016. It also co-produced THE HARVESTERS by Etienne Kallos, supported by Eurimages, which was nominated in the section Un Certain Regard of the last Cannes Film Festival and SUMENDIA by Miguel Angel Jimenez, also supported by Eurimages, which is currently in post-production. In 2014 Heretic launched Heretic Outreach, the international sales arm of the company that handles internationally outstanding films such as Ralitza Petrova’s GODLESS (Golden Leopard, Locarno IFF; EFA Discovery Nominee 2017, Isabella Eklöf’s HOLIDAY (Sundance World Cinema Competition) and Muayad Alayan’s THE REPORTS ON SARAH AND SALEEM (Special Jury Award, Rotterdam IFF).